Looking for a violin for beginners that doesn't break the bank? I have some tips and suggestions for you, including my recent hands on experimental trial of the $150 dollar violin. Check out these three options and why they may be the perfect instrument for you! A Violin for Beginners that Doesn't Break the Bank....SAY WHAT? !...Actually I've got Three! Bonus - Don't forget to check out the picture guide below on how to change the strings! Great violins for beginners do not need to cost a fortune. While I refuse to use the term cheap violin (because they are NOT cheap in quality), these three instruments may be perfect for you if you live on a - house is furnished by craigslist, teach your kids to run away from the icre cream truck, date night equals watching a movie on your couch - type of budget. So, you must know something about me, I am a firm believer that you shouldn't scrimp on the cost of your stringed instrument. More truly is more, and 'you get what you pay for' both apply in this case. However, I am also a firm believer that each child should have the opportunity to play music, and I get that times are tough and belts are cinched. These three violins are pretty stinkin' affordable when it comes to the world of string instruments and still maintain a good standard of quality, but if you can spend more I recommend that you do so. In fact, I also include on this page links to more expensive models of the same violin brands that are reviewed here. Any violin you see listed or linked to in this article is HAND PICKED by me and not just stuffed on this page by some random money-making-ad-generator, they would all be great violins for beginners and intermediate players. Recently I decided to do what I before now have refused to ever consider, buy a violin for less than $200.00...in fact, I bought three of them (And they were closer to $150.00 than $200.00!). After sweet talking my husband into the idea (which also may or may not have necessitated baking multiple batches of my famous chocolate chip cookies) we invested $450.00 (remember we bought THREE of them) for the purpose of finding my readers the best violin for beginners. I take this online site very seriously and work hard to only recommend products that I PERSONALLY have purchased and test driven myself. While I may have the advantage over you of knowing what a good instrument feels like, sounds like, and looks like, I am your soul sister on being a busy mom and making ends meet monthly. So without further adieu here are the three great beginner violins with an honest (these reviews are not candy coated!) summary and short list of pro's and con's to each instrument. You'll also find a complete photo shoot for each violin because at my house violins are celebrities! The Cremona SV - 130 - I purchased my cremona directly from Amazon, I wanted to see how quickly it came, how safe it traveled, and, of course, I wanted to take advantage of Amazon Prime. Honestly, I was not disappointed in the shipment of the Cremona. It came quickly and safely! The packaging seemed to hold well. The violin needed a good tuning and the bow needed rosin but other than that it was ready to play out of the box. I thought the strings were good enough that they wouldn't need to be replaced by a more expensive brand, which is usually not the case with less expensive violins. In fact, I tried experimenting with changing the strings and it didn't make a notable difference...cha ching, money saved! Just a little tip, if you'll notice in the picture below, there are some plastic protectors that come on the string that should be positioned over the bridge. When I got my violin they were loose and had fallen down by the fine tuners. This is not an uncommon thing to have happen to any violin after being shipped and is not a problem or a sign of poor quality.When you first tune the instrument, loosen the strings enough to slide them back onto the bridge. It has a smooth finish and edges, feels well made, tunes easily, and has a good, solid, warm sound to it. I can recommend the quality of this violin for the price that you pay without any hesitation! It's a good violin for beginners. This violin should easily withstand the battlewounds often inflicted on istruments by young beginners. Another bonus, the Cremona I have linked to here comes fully outfitted minus the shoulder rest. I have to be honest, I was shocked by the color, and not necessarily in a good way! 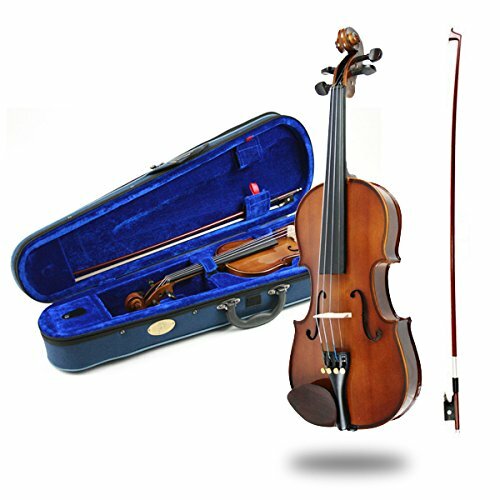 I hesitate to tell my readers that because this is such a good little violin especially for the price, and I don't want to discourage you from buying it. BUT if color matters, or looks matter you will need to weigh that out. My first thought when I opened the case was, "Wait, did I order a green violin". I guess some may argue that it is a gold finish, and my husband pointed out that the green case it came in cast a green hue on it. I did get a little more used to it over time to where I didn't think it was half bad, but this is not your traditional brown/red looking violin, so be prepared. The finish of the instrument will be impacted by price so if you are willing to pay more for a high SV model, you will be happier with the color. All of the images below are of the Cremona SV-130. Notice how different the varnish looks with the white background (I like it much better against the white) versus the violin case or the black background. If the color does bother you but you like the violin, you can spend a little more money to upgrade. Anytime you pay more the quality of every aspect of the violin will improve including the color and the varnish! To read more about higher grade Cremona brand violins click here. Once the strings were changed (read more about this below) this violin's sound really opened up to be nice and full. I feel like a beginner could really learn violin on this instrument and be able to get a nice sound out of it. 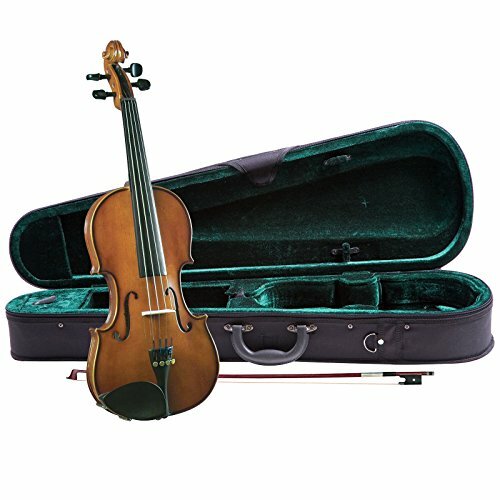 I was so tempted to purchase the Stentor 1500 Violin , but I was really trying to get the price down to $150. The Stentor 1500 is usually 250.00, but you can usually find it on sale for less than $200.00. 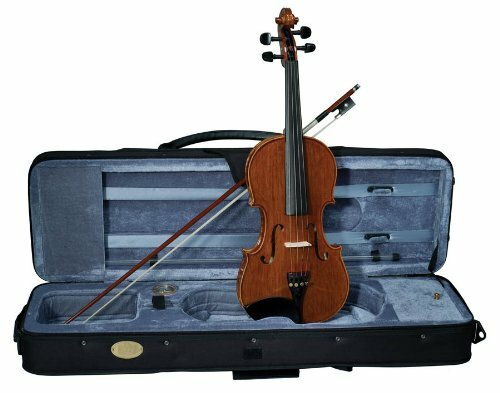 The Stentor 1500 violin jumps up in quality significantly over the Stentor 1400, but since this isn't a review on the Stentor 1500, let's get on to the review of the 1400. I liked the looks of the Stentor Violin 1400 over the Cremona SV-130. It has a nice color. It's a pretty violin. Another bonus was that the pegs and chin rest were not black, but a rich brown. This makes it look more high-end then it actually is! I liked the added effort by Stentor with the pegs and the chin rest, and so did my girls (they like it when a violin their size looks like my violin). The violin I ordered (which can be found here ) came with a nice unique case (check out the pictures below...I like it), a good bow, and rosin. So, pretty much everything but the shoulder rest. This is considered a complete violin outfit, and not bad for the price too! Of the three violins I tested this violin was the hardest to tune and most likely to go out of tune. Although annoying for me this wasn't a problem because I can tune all day long, but for students who have parents who don't know anything about the violin this can be frustrating. If you order this violin and it seems to slip out of tune easily...don't despair. There are remedies! Take it to a violin shop where they have products to use, the ability to restring, or shave down the peg if need be, all of which would not be expensive. Another option is time. Many strings and new violins will slip out of tune easily at first but over time as the strings get stretched out they will stay in tune better. Speaking of strings, another downside to this violin is that it comes with red label strings which I don't really care for. I felt like this instrument's sound GREATLY improved by changing the strings which you can read about here. Below is a second gallery of me changing the strings. I hope to do an entirely separate post someday completely dedicated to directions on how to do this easily, but for today hopefully pictures truly are worth a thousand words. Picture Guide on how to change your violin's strings! Review of the Franz Hoffman Amadeus violin. Last but definetly not least is this lovely violin. I really liked the Amadeus, a lot actually. It definitely earns a spot on a page dedicated to good violins for beginners. I felt like Shar music, the maker of this instrument, undersells it's quality by listing it simply as "an affordable alternative to a V.S.O. (aka "Violin Shaped Object"). It goes beyond just an alternative to violin shaped objects and by it's own right is a great little violin. My daughter is currently playing on it's older and more expensive sister the Franz Hoffman Etude. You can find the Etude directly on Shar's website. It's a great violin, we've been very happy with it. It run's in cost between 230.00 and 300.00 depending on what accessories you get with it, and whether or not you change the strings (which I highly recommend). I ordered the Amadeus directly from Amazon. This was the only violin of the three that I ordered that didn't come with an outfit (case, and bow). So I was curious about how well it would ship. I'm happy to report that it was in great condition when it got to me. It was shipped in a box within a box with plenty of packaging to keep it safe. This violin has a really shiny varnish. The color is probably most easily and simply described as red. It had variation to the stain and varnish which is a good thing as it let the characteristic of the wood show. This is sometimes referred to as the flame of the wood. The solid craftsmenship on this violin was apparent especially through the scroll and neck of the violin, which is a common place for violin brands to cut corners on beginning violins. The peg holes were accurately cut and smooth. I was also impressed with the strength of the sound in terms of loudness. This violin has a nice big sound which is sometimes also lacking in smaller beginning violins. It is easy to play this violin and get a nice big sound which can help motivate younger students. As I mentioned before this instrument does not come with an outfit. 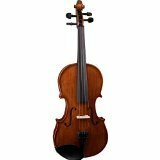 It is currently priced around $129.00 which makes it super affordable but after you factor in case and bow the cost is more likely around $180.00....still not bad for the type of quality instrument you are getting. If you're going this route you should read about my favorite bows and cases, I have some great affordable recommendations. Gallery of the Franz Hoffman Amadeus Violin (with guest appearnces of her sister Etude).